FGJackyBold-Regular font family series mainly provide Regular and other font styles. FGJacky-Regular font family series mainly provide Regular and other font styles. 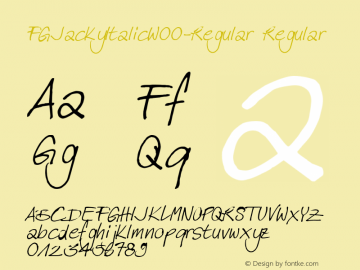 FGJackyItalic-Regular font family series mainly provide Regular and other font styles. Jacky_Egypt font family series mainly provide Regular and other font styles. JackyHand-Regular font family series mainly provide ☞ and other font styles. FGNandoBold-Bold font family series mainly provide Regular and other font styles. FGNorah-Bold font family series mainly provide Regular and other font styles. FGTraciBold-Regular font family series mainly provide Regular and other font styles. FGNandoBoldItalicized-Bd font family series mainly provide Regular and other font styles. FG C J font family series mainly provide Regular and other font styles.